Now, I know you probably want to visit the site to view our lovely ads (which, by the way, make me little to no money — I’m quite certainly not profiting financially from running this site,) but I urge you to subscribe anyway. The formatting might not be quite as nice, but if you read through the brief bit of post and are interested in reading more, it’s a short process to click and read the rest. Even if you aren’t a regular reader, I think you should subscribe. We don’t post so much that your reader will be overwhelmed, and we try to keep things interesting with new features exploring the world of independent music. 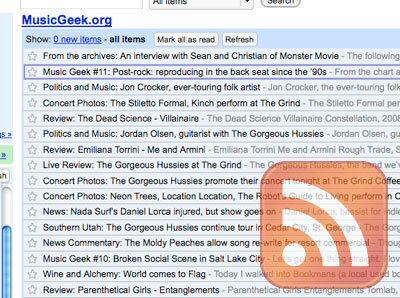 We’ve also reported news right as it happened in the past; subscribing will pass that advantage on to you. I recognize the fact that not all of you readers even use feed readers, so let me quickly outline what I find advantageous about using them — specifically Google Reader. The ability to organize the sites I regularly read is a big selling point: I can quickly and easily read new posts right as they are posted rather than sort of stumbling on them during a regular visit. I still visit these sites regularly — there’s more to most than just their posts — but this allows me to read the latest in news, critique, and more. The ability to read these feeds from more than just my web browser is nice, as well: An hour of boredom waiting for a plane can be turned into an hour of catching up on feeds — or two hours of reading and an hour of screaming because you missed your plane. Just saying. Since really diving into RSS feed reading, I’ve gone from reading a couple web sites intermittently to reading many web sites daily: I catch more news, more entertainment, more everything. In the same time it took me to read those two sites, I can read seven, eight, or more — just because I don’t have to remember what I read regularly. Yeah, I’m forgetful. Beyond that, I can more easily skip posts I’m not terribly interested in, which rarely happens anyway. 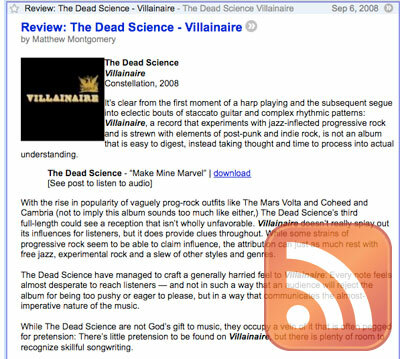 Honestly, I can’t sing the praises of Google Reader highly enough — but don’t just take my word for it.